Oriental Trading Company will be sending us supplies to use in our son's community service project, aimed at donating bags full of toiletries and fun items to children of local families in need, in exchange for sharing these kid-friendly summer fun picnic ideas with 3G2S readers. By the time we are halfway through summer vacation, I am usually looking for fresh ideas to create some fun memories for my children. Planning something fun doesn't necessarily mean it needs to be complicated. There are two things I try to do . . . get the children involved in preparations and keep some supplies on-hand for impromptu fun. Oriental Trading Company is my go-to place for fun ideas year-round. 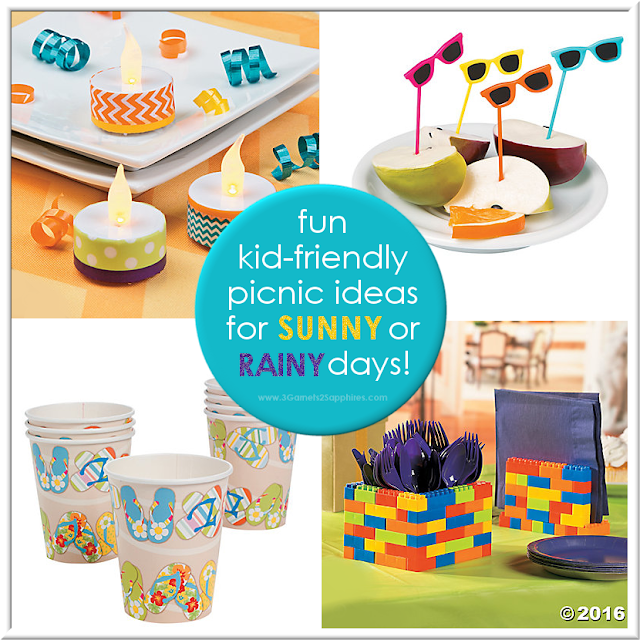 You can find everything you need for a kid-friendly picnic indoors or out among their extensive collection of Picnic Party Supplies. There, you will find everything from colorful gingham plates and napkins to fun summer-themed picks. One picnic must-have would be the disposable checkered tablecloths, available in 4 colors. They come in a pack of 12 and are perfect to cover your picnic table outdoors or to sit on during rainy day indoor picnics. Keep it simple, but colorful! My children would be perfectly happy with cheese, crackers, pepperoni, and fruit for a lunchtime picnic. We try to keep a supply of colorful picks in the kitchen drawer to add some fun to cut fruit or cheese. 4 Fun Ways Kids Can Help to Prepare for a Picnic . . .
1. Ask your children to build a utensil holder and a napkin holder out of plastic interlocking building blocks. 2. Have your children decorate LED tealights with colorful washi tape for a flameless candlelit meal. 3. If you don't already have picks for serving bite-size food at your picnic, ask your children to make some with toothpicks and washi tape. 4. When you have cut all the food, whether it be sandwich quarters, cheese, fruit, or something else, ask your children to arrange them in a pattern on plates or platters for you. For more creative summer fun ideas, visit the Create Fun blog! What ideas do you have for a fun kid-friendly picnic? Share them with us in a comment here and be sure to pin this post for later.